It's Hungry from those Weight Watcher's commercials! You know, this guy? Now, Weight Watcher's wants you to banish Hungry (who I must say is the most adorable junk-food-pusher since my hubby John) by joining some program of theirs. However, the decorator of the above CCC and I have an even better idea: eat cupcakes. See, eating cupcakes is ALSO an effective way to banish Hungry. Right? Seriously, you can't argue with this kind of logic. Colee, is it wrong that this makes me hungry? That was my first thought too. My second thought was "The Thing" from Fantastic Four. Ok, I can look past the swirly poo frosting and missing eyes and eyebrows but what's with the 6? I love this fuzzy orange dude, too! And he's on our TV every other minute, too, so that's a good thing. Now I just want to cuddle up with mr hungry and eat some cupcakes.....it's soo wrong! 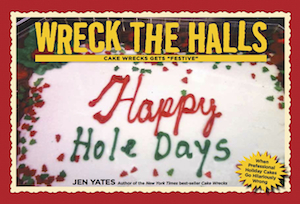 *stares at the cake* Yep, that's just what our yard looked like when my dog ate a sack of flower bulbs (don't ask me what he was thinking). I found lots of little perfect piles just like that in just that color. Only his arrangement was off...I'll have to mark him down on presentation I guess. Incidentally, I'd never seen the Hungry commercials but he is awfully cute. I suspect some distant relation to Cooke Monster. I WANT that Hungry guy in my house!!! Seriously! I wish they would sell him (or a reasonable facsimilie of him in cuddly plush form). He's SO SUPER CUTE!!! LOL! It's so true! It DOES look like Hungry! And I love when, in the commercial, the woman opens her laptop, and Hungry opens a pizza box. CLASSIC! LOL! OMG that is way too funny!!! All that CCC needs is little eyes!! I think I'm in love with "Hungry". He is freaking adorable! When I see the commercial, I ask the hubby if I can switch the two of them out since hungry will give me the food I want and hubby gives me whole grains. Lol! The cake, though, is not adorable, it's atrocious. And what kind of Weight Watcher's celebration offers cupcakes?! Shouldn't they be little individual salads or something? not any more wrong than when i watched "Super size me" and then told my husband i wanted a quarter pounder! Oh dear, WW have got it so very wrong here! Who would want to banish such a cute junk food monster, not me, that's for sure?! He's too cute, shouldn't 'hungry' be made out to be some ugly fiend, that might actually work! 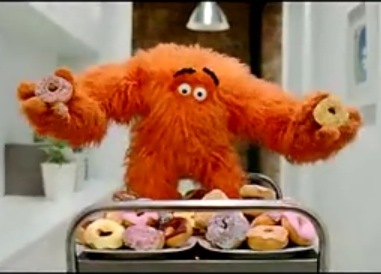 every time i see that commercial i tell my husband, "i want one of those furry things what throw you doughnuts!!" All I want to know is...why doesn't hungry ever show up in my living room juggling cupcakes? I might like a cupcake, but hungry makes me fetch my own. dirty bugger! Ok, I'm just CRACKING UP over that laptop/pizza scene. PRICELESS!!! Wish they'd show this one around me. And where can I get a "Hungry" stuffed animal? I want one! As a WW lifetime member, I must say I laughed enough for co-workers to stare. I even sent the link to my meeting leader! 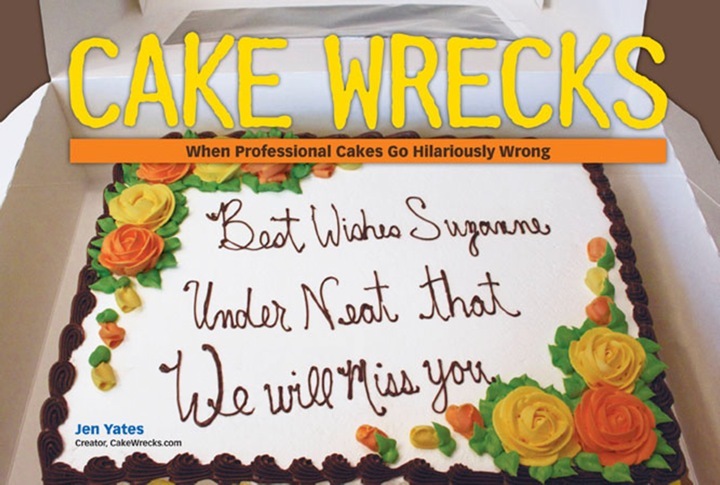 Word ver: weedfu - If weedfu(ll) up on CCCs, we'd need to go to Weight Watchers! Those cupcakes are the exact same shade of orange as the squash and carrot soup I had for dinner last night. That's not exactly appetitising, as far as desserts go. I would love a Hungry cake! Have you noticed that Hungry has no mouth? It's kind of sad how wants us to eat because he can't. It's a dark, vicarious life he leads. "Weight Watchers’ Hungry Totally Looks Like Gossamer from Looney Tunes"
I am on WW and those commercials actually make me hungry....it is wrong somehow. Maybe that is the plan? I shall assume it is 6 Weight Watcher "points" per cupcake? we don't get that commercial here (chicago) -- either that, or i just don't watch enough tv. i think "hungry" in the commercial is adorable. "hungry" the ccc is a wreck! Eight bucks for 12 cupcakes of a headless shirt? No thanks. 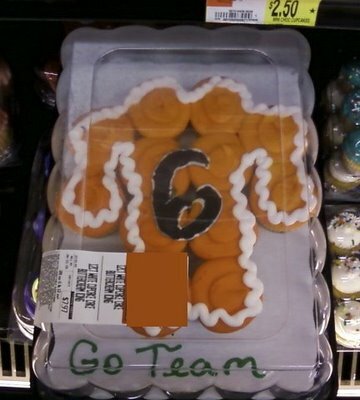 Actually it looks like Gossamer, who was original, whom Hungry looks like..
Dudes, the cake is supposed to be an orange jersey with the #6 on it for some kind of sports team. The resemblance to the Weight Watchers guy is unintentional. My husband *loves* Mr. Hungry. Thinks he is the cutest thing ever. Me..I just feel bad when those books fall off the table and hit him in his special place. Isn't it bad enough he has no mouth to eat? Now he can't even cry out in pain? Poor Mr. Hungry. You bessinag at me to eat healthier when I see Mr. Hungry cause he makes me want to eat junk food! I love Hungry! :) He's the cutest thing ever, and I have to say, I'm not interested in getting rid of him in the Weight Watcher's way. When Hungry shows up I go for chocolate cake. Cause if you are what you eat I want to be a rich hunk. That monster is the BEST. I love it when he opens the pizza box like a laptop. He's too cute, you just can't refuse temptation when it's so cute! As always, great blog post! I. LOVE. the hungry monster! spesh when he pretends to type on the pizza. I must be in the minority, but I hate that commercial. "Show Hungry who's boss." Why not Hunger? At least that would be grammatical. Okay I'm sold! I would like to buy the ugly orange CCC. Wow, that cake does not make me hungry. But you are right, eating cupcakes is a good way to banish Hungry!!! February 19, 2009 | I Love Baby Quilts! @dr_igloo - Dude, we totally already knew that. Give us a little credit. For the last few days I was thinking that making some cupcakes sounded like a good idea....UHMMMM...now...maybe not. Perhaps I'm the only one here who sees it, but this is clearly the orange "T" from the University of Tennessee Volunteers. I say "clearly" but really I mean a poor attempt at making a "T" out of cupcakes. Not that I like the Vols, but I live where tons of folks do. Six is the number of pounds you gain from eating the cupcakes. To Mario: It's not ungrammatical; Hungry is the name of the "monster." WV: lenting. Isn't that what many Catholics will be doing in a week or so? Hungry is my fav junk food character...whoever came up with it is brilliant...he appeals to everyone and he's cute and fuzzy too...Love this post !!! OK, so this is my first sighting of the WW mascot/whatever, so maybe this is old news... but does anyone else find it odd that "hungry" doesn't have a mouth? Hey, on second glance, I think these are cinnamon rolls "duded up" with frosting ! I'll go to WW if those are the refreshments!